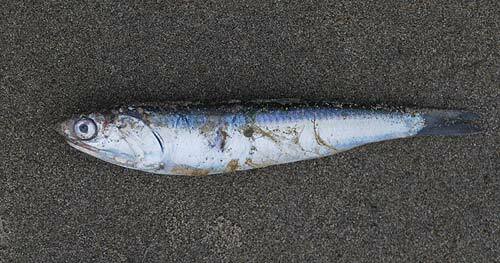 (Seaside, Oregon) – Thousands of tiny fish are dying in the waterways of the north Oregon coast town of Seaside, clogging the Necanicum River with the bodies of anchovies, from the ocean's entrance and estuary through parts of downtown. It's creating a smelly, stinky mess, but it's also creating a major field day for bird watchers. (Photos courtesy Tiffany Boothe, Seaside Aquarium, unless otherwise credited). The irony: it's a sign that local anchovy populations are doing well. But stranger still: this could be a sign of a trippy sight seen on the beaches at night. Tiffany Boothe of Seaside Aquarium said the sight is not that unusual. It happens every few years in this area. 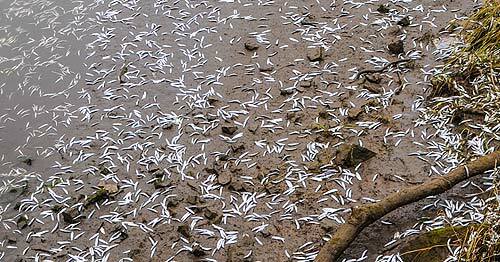 Local populations of anchovies swell to such numbers they deplete the oxygen in the river and choke to death. 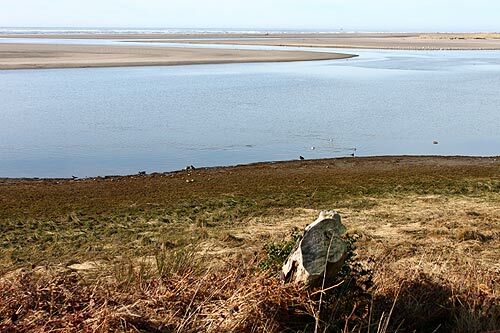 This particular incident is a bit unusual, since normally the fish die-offs don't go far beyond the mouth of the Necanicum River and its estuary. Indeed, like previous years, this means a huge spectacle of birds like pelicans and seagulls attacking the river and waterways as they pick off the fishy morsels. 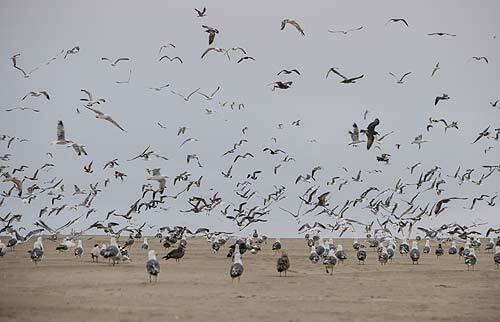 Boothe said bird lovers will love the mouth of the Necanicum on the northern end of town. 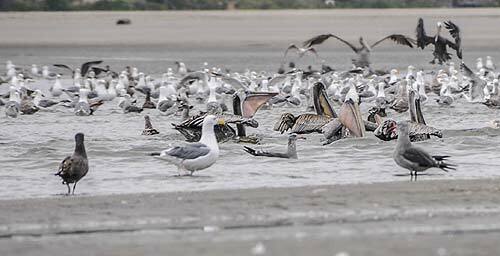 “Here you will find numerous pelicans, blue herons, cormorants, and hundreds of seagulls all feeding on the anchovies,” Boothe said. 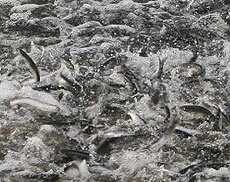 When there is a big run of anchovies, this in turn can be a sign of a large upwelling from deeper in the ocean. These incidents of colder water from below bring up more nutrients, which attracts the next step in the Pacific Ocean's food chain – the baitfish. Some years, the fish are still alive and manage to cause a raucous with the birds. One such event in August of 2007 was so wild that the fish actually hopped out of the water at times. Such cold upwellings from the ocean can also be a sign of other interesting aspects to look for, like the “glowing sand” phenomenon at night on the beaches. This is where tiny, greenish blue sparks can be seen at your feet, usually in the wet sand, on a very dark beach. These are caused by a form of phytoplankton called dinoflagellates which are bioluminescent, like fireflies. They often appear in huge numbers this time of year anyway, but such an occurrence of lots of baitfish can also be a sign that the glowing creatures are in abundance as well.